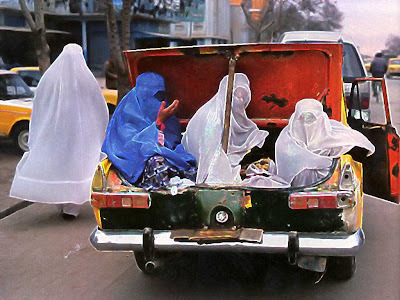 FRANCE: SARKOZY BALKS AT BANNING THE BURKA……. – The Tundra Tabloids……. Democracy bears the seeds of its own demise. It all works wonderfully well if all the participants within that society play by the same rules that governs all. But the applecart gets overturned when any group subverts the rules to carve out special, or exclusive rights for themselves to the detriment of everyone else in that society. Once that is allowed to happen, the end of that society, founded upon democratic pluralism, is a forgone conclusion. PARIS (Reuters) – France will issue recommendations against full face veils but not pass a law barring Muslim women from wearing them, a leading backer of a legal ban said on Friday. France banned Muslim headscarves in state schools in 2004 following a similar inquiry and looked set to bring in an outright ban on veils coverings the whole face, such as burqas or niqabs, when it launched the panel last June at the request of Gerin, a Communist deputy from Lyon. But at its weekly hearings, legal experts, local officials, Muslim leaders and even some militant secularists have told the deputies on the panel that a ban could be anti-constitutional, counterproductive and impossible to enforce. Backing off from a complete ban, he said the panel might propose “radical measures” to ban full face veils in municipal hospitals and other public institutions, but gave no details. Previous Post Previous Post RUSH LIMBAUGH ON OBAMA’S SPEECH AT FORT HOOD MEMORIAL……. Next Post Next Post TOP IRANIAN CLERIC IS ISLAMOPHOBE FOR DEMANDING BRITISH MUSLIMS NOT TO SERVE IN THE MILITARY……!